While preparing for our trip to Washington, DC, I read numerous times how magical and inspiring it is to see the monuments lit up at night. Since I knew that we would be walking A LOT during our day in DC, I knew that we did not want to walk too much in the evening. So, I looked into tours and found Old Town Trolley Tours. Most of the evening tours start at Union Station which was quite a hike from our hotel. Old Town does pick up guests from several hotels around DC to bring them to Union Station for the tour. I liked this option to rest our weary legs and to not have to pay a cab to take us to Union Station. We arrived for a pick up at one of the designated hotels near ours. Very convenient! Although the tour was a lengthy one--about three hours--we really had no idea! First of all, the monuments and building lit up are captivating. In fact, some were crafted with night viewing in mind! Plus, our guide Jason provided us with lively yet informative commentary. As Jason drove us through DC, he nimbly oriented us and provided us with anecdotes and interesting facts about the city. 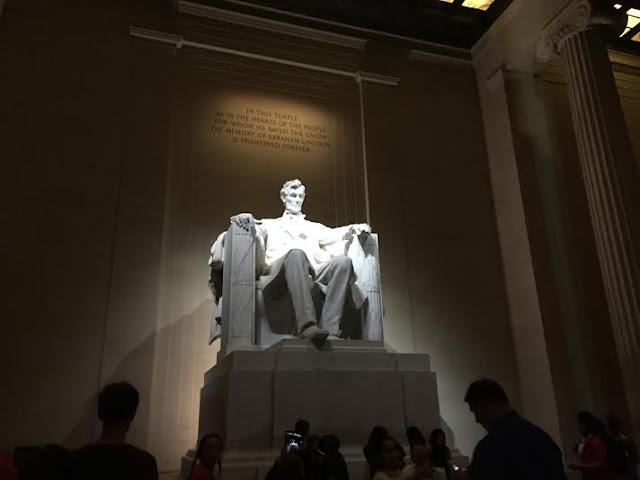 Our tour included three stops that allowed us to explore on foot and get some up close views of monuments. The first stop permitted us to view the Lincoln Memorial, Korean War Memorial and Vietnam War Memorial as well as the Washington Monument in the distance. 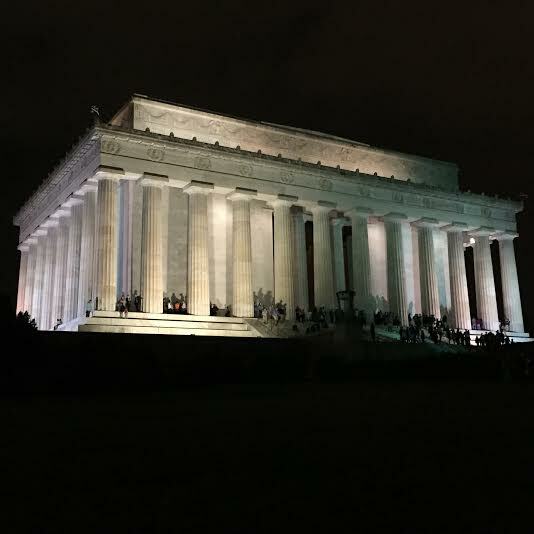 The Lincoln Memorial certainly stuns against the night sky. While in the Lincoln Memorial, the skies opened up and it started to pour. Although the rain did prevent us from having time to view the Korean War Memorial lit up for night, the view of the Mall with the rain was neat. 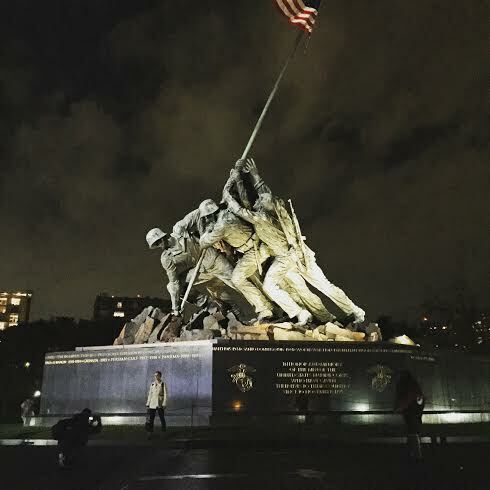 After visiting the Lincoln Memorial, we headed over to the Iwa Jima Memorial. 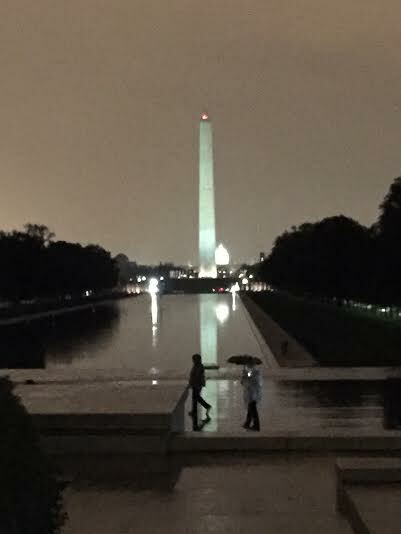 Seeing the memorial under the night sky after a bit of rain was magnificently eerie. In some ways, you almost felt the smoke of battle about. We were able to walk around the memorial to get the full effect. Before stepping out to view the memorial we learned interesting tidbits about its history and the famous photo it is based upon. From here, we meandered towards the Martin Luther King, Jr. Memorial. 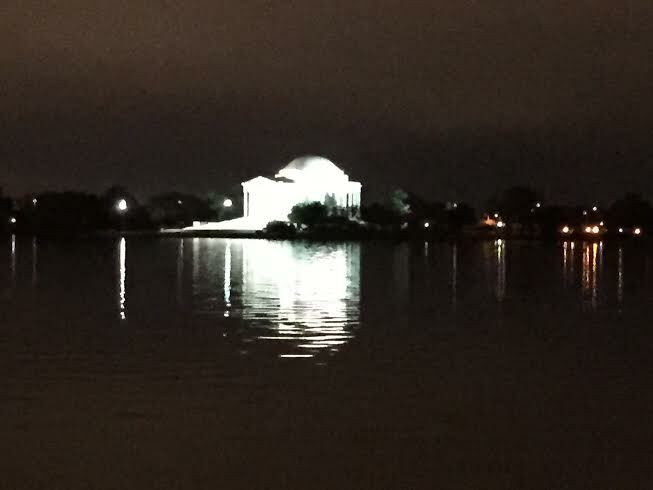 On our way, we viewed more of the city under lights and passed by the Jefferson Memorial. Upon arrival at the Martin Luther King Jr Memorial, we could see the Jefferson Memorial across the Tidal Basin. The memorial seemingly glowed! The Martin Luther King Jr Memorial has visitors walk through the mountain of despair to the stone of hope. 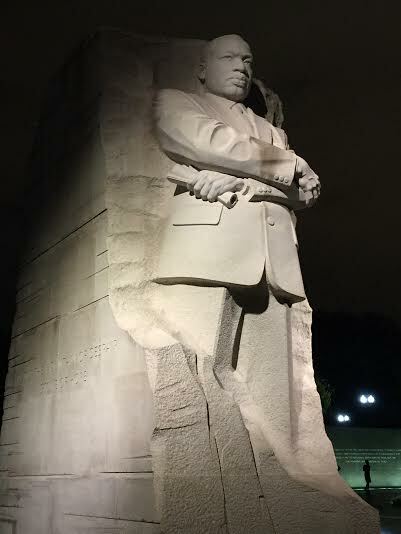 Martin Luther King Jr's figure is certainly impressive and rests near the Lincoln Memorial where he delivered the "I Have a Dream" speech. When we left the trolley, my husband divulged that he loved this tour more than any we had been on. My daughter was engaged during the how tour--no mutterings of being bored. The tour was very inspiring and fun--one that we recommend to other visitors! Bring along a little snack and a bottle of water. Be aware the restrooms may be closed. The ones in the Lincoln Memorial were open when we were there. The tour guide will give you guidance and take the first opportunity you get to go to the bathroom if you think you will need to go. There are many tours so pay attention to the tour bus number and your guide's name. Old Town Trolley does have pick up points at select hotels. If you are opting for one of these pick ups, you do need to call 24 hours ahead to confirm. Also, be sure to reserve the correct evening tour--not all of them have the pick up option.